I can say it’s a front beach guesthouse but don’t expect to find a nice beach in front. It’s full with local boats and some garbage. I booked for a twin bed, fan room with breakfast for Rp. 120,000. My room is located in ground floor, right in the corner. There’s hardly sunlight in front of our room and no place to hang my wet clothes. So it’s a little headache for me, thinking where I could hang my cloth, towel, wetsuit etc. I tried to hang them in a chair, put it on the garden but ended up having their cat slept on it hahaha…. My sister was so pissed.. it’s funny though I just found it weird that their staffs saw it and did nothing about it. In the morning, there is a nature alarm (rooster) which felt like living in the country. The air was cold and the water was freezing so I wish there were hot water. I wish I brought my jacket too. But despite all of the above, I enjoyed my stay there. 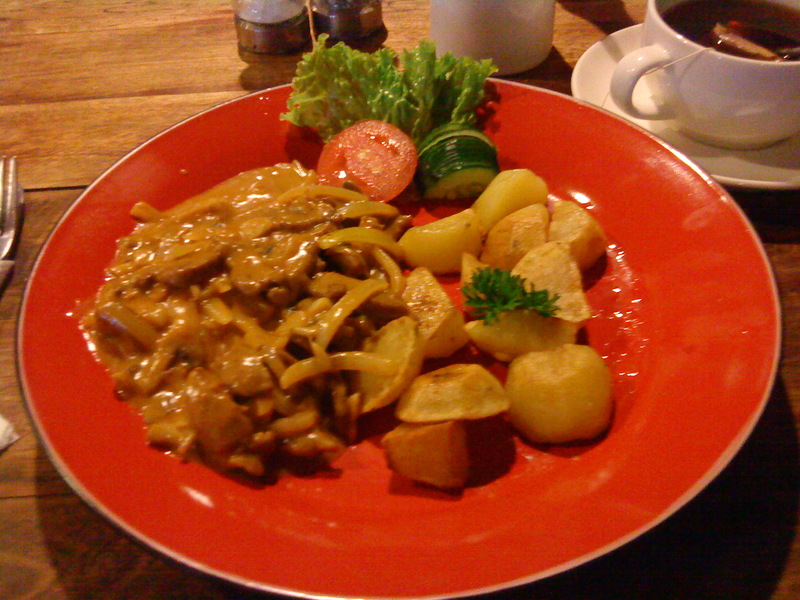 It is located in the middle of busy Legian street, surrounded by cafes, restaurants, shops, convenient store etc. Good location. They have swimming pool and fantastic garden. I like the garden. I stayed in their standard room in the 3fl, just right in the corner. The room is clean and big but old. Extremely too expensive for USD 45/nite (agoda.com) but it was high season. The twin bedroom is actually a bamboo bed. It’s so weird seeing a springbed on that bamboo. Anyway, I will be back if I can find a lower/promo rate. Denpasar Airport to Padang Bai: Rp.300,000 by APV car, rented from dive center. Padang Bai to Legian: Rp. 250,000 by APV car, rented from dive center. 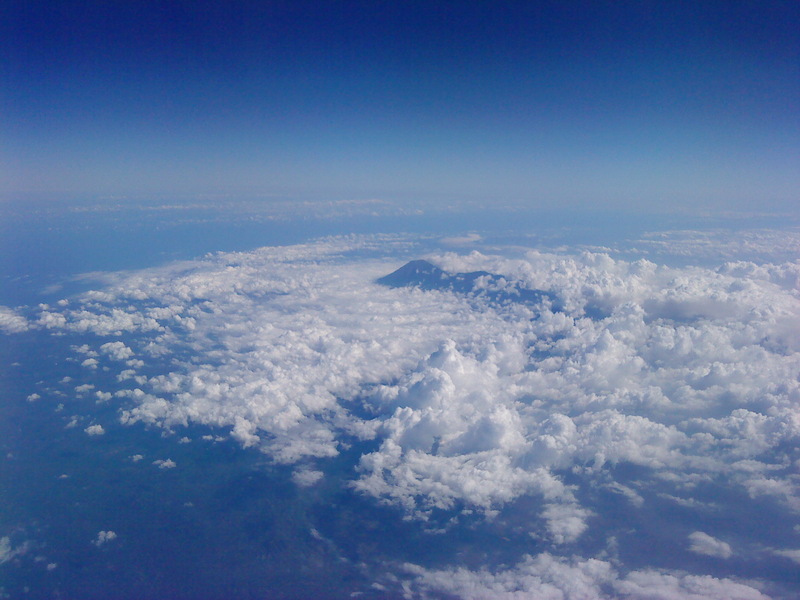 Legian – Denpasar – Airport: Rp. 140,0000 by Blue Bird taxi. 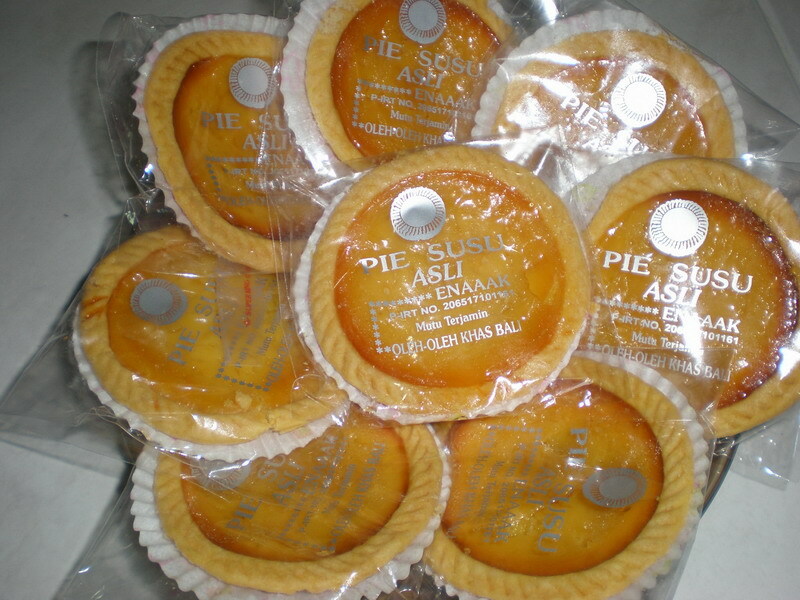 I needed to take Pie Susu snack in Denpasar. It’s indeed very expensive comparing the usual Legian – Airport cost of Rp.40,000. located in front of Padang Bai Police Office, in the entrance gate to the pier. located in Jl Pantai Silayuki. located in Jl Kunti, Seminyak. I’ve been reading the review about this restaurant for a year and finally I could have a taste of it. We went there on Saturday night, the place was so crowded that there were people queuing including us. However there was this Italian Guy, probably the manager, who was kind enough to find us a seat and for other guests too. While the waiters, they ignored us completely. Anyway, we ordered their house special pizza (forgot the name and it’s delicious), salad (best one ever), spaghetti carbonara with bacon (extremely salty , didn’t finish it) and some drinks. We spent about Rp.150k-200k. located in Gang Ronta, Poppies Lane, Kuta. Cannot miss eating at this cheap local restaurant with a good taste of Indonesian food. I ordered my usual menu: tempe, sweetsour chicken, potato with sambal, capcay veggies and rice for Rp.14,000. Massage at Angeline Spa, our fave spa in Legian Street. Price is Rp. 75,000 for 1.5 hours body massage. 2 dives in Padang Bai with Blue Bubble Bali for Rp.540,000 exclude equipment. Snorkeling in Padang Bai with Blue Bubble Bali for Rp.150,000 include equipment. Discover Scuba diving with Absolute Scuba DC, Padang Bai for Rp. 200,000 include equipment. 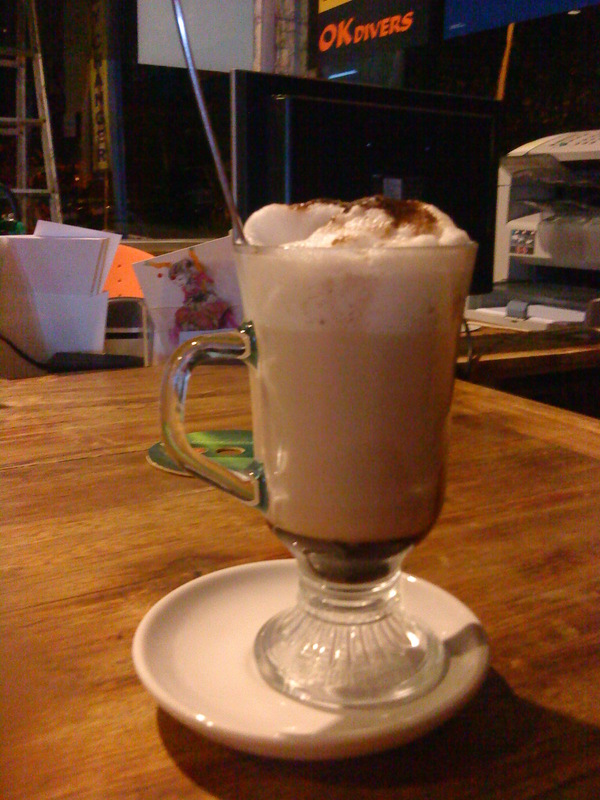 Pie Susu Bali, Rp. 2,000/piece at Toko Bahagia, Denpasar. this store is full will local snacks. It supposed to be a one week trip. Got a really good ticket price from airasia <a year ago>. Too bad I had work to do so couldn’t travel around as planned. I missed going to Nusa Lembongan Island… again.. but I am happy I finally did diving in Padang Bai. Our 10am flight was delay for 2 freaking hours. It ‘s the first time I had this very long delay using Air Asia. They gave us drink and Jco donut but our plan that day got messed up. I missed visiting Bloo Lagoon Beach. I always wanted to go there. It was one of the must-see-place in our list (mine actually) because I am curious with all the review I heard. In the other hand, our driver has been waiting in Bali Airport since our supposed-to-depart time. He waited for us for 4-5 hours. Poor him. Plus.. actually my sister almost didn’t make it but I was glad she could settle her issue that morning. …. hm..the trip didn’t start so well..
We arrived in Bali around 15:30 and went straight to Padang Bai. It was about 2.5 hours, a long drive. plus we were starving to death. We stopped in a minimart to buy some snacks though. I decided to go to Padang bai this time to see its awesome underwater I heard. Christian, the owner of Blue Bubble Bali DC (dive center), greeted us when we arrived there. He showed us our guesthouse, which was only few feet away from his dive center. His dive center is small. Well, I guess not many big DC there since it’s a small city. Although I heard the underwater is great. Well, it’s a small place, just in front of the beach <but not really tourist type of beach>. I need to passed a small alley to get into this guesthouse, Marco Inn, kinda give it a feeling of hidden place. The lady greeted us nicely and showed us our room in the corner. We put our stuffs and started our first hunt for the thing we most craved for that time.. that would be a decent food as our late lunch and early dinner. I tried to contact some friends of mine who were there for diving too. Thinking they might be able to give some recommendation for restaurant. But my mobile seemed having no signal there.. It really pissed me off after the whole delay thing combined with hunger etc.. Lucky I brought my other mobile operator (telkomsel) which could work there. I finally could contact a friend, got some good resto info and we chose to taste the local food. We went to the street in front of the pier entrance. There are some warung (local restaurant). I was attracted with Warung Jawa (Javanese Food stall). Actually I don’t really like the real Bali local food cause there is this specific spice “kencur” that makes the taste so not-for-my-tongue. So I am glad there is this Warung with Javanese taste. Its price is so cheap too. After having dinner, we went back to our room to clean up and damn.. the water was ice cold, but we had to clean up. Later that nite, we spent it hanging out with some friends at Buddha Bar in Padang Bai Beach Resort. It was all about diving talk. A great talk Well, the night was ended by us walking down the street, back to our guesthouse, with the sky full of stars. Something I couldn’t see in the city. Our day started great = I woke up quite early . Sometimes I wonder why I always wake up so early during vacation. I wish I could do the same when I am not in holiday. LoL.. Anyway, I think I woke up early that day because my bed was not comfortable. It felt like there was a hole in it. There were also sounds of birds chipping and boat whistle, feeling like living in the countryside and like the nature ‘alarm’. Since I couldn’t sleep again, I went to see the sunrise from the beach in front of Marco Inn. It was beautiful. There were many local people there or maybe the boat owner or fishermen. The beach was full with the boats…… and garbage. Too bad for a white sandy beach. After breakfast <I love their banana pancake. Their toast is also good>, we started preparing our equipment for diving and snorkeling. My sister was so nervous because that was her first time snorkeling in a less crowded ocean. She even became more nervous when she found out that no guide accompanied her snorkeling. It seemed there was misinformation from Christian. While me, feeling so lucky coz it is not allowed to dive alone LoL.. Plus I was accompanied by a divemaster who turned out to be from Switzerland and a very handsome one hahaha…Anyway, the dives went great. 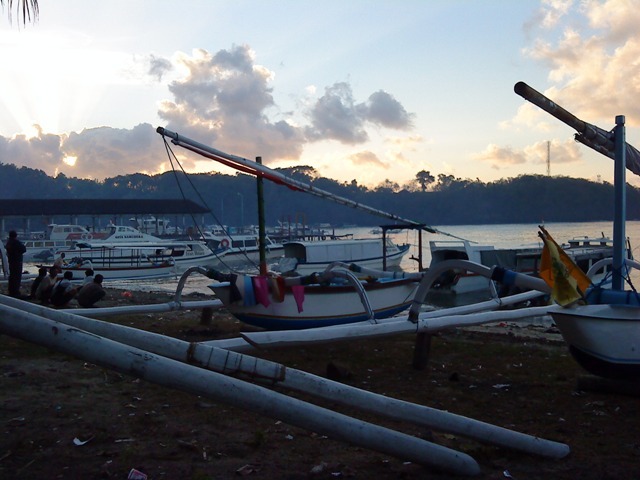 I had 2 dives, one at Jepun site, the other one at Bloo Lagoon. I can see Bloo Lagoon beach from the boat and I thanked God for my flight delay so I didn’t have to go to that ‘regular’ and ‘less sandy’ beach.The highlight of my dives would be seeing 3 white tip sharks, one is pregnant (I was hoping not to see them actually. scared & nervous) and orange bat fish and green star fish. I have seen blue and red starfish in Menjangan and Tulamben and it is my first time to see the green one. I wonder how many color the starfish has. In the other part, the snorkeling also went great, I guess. Well, she seemed tense and a little bit sea sick, plus the water was so cold that she didn’t snorkel very long. But from her story, I could tell that she was very excited to be able to see colorful marine life there. It is a good sign for me ^^/ why? Because if she likes the marine life, there is a chance she will try diving. 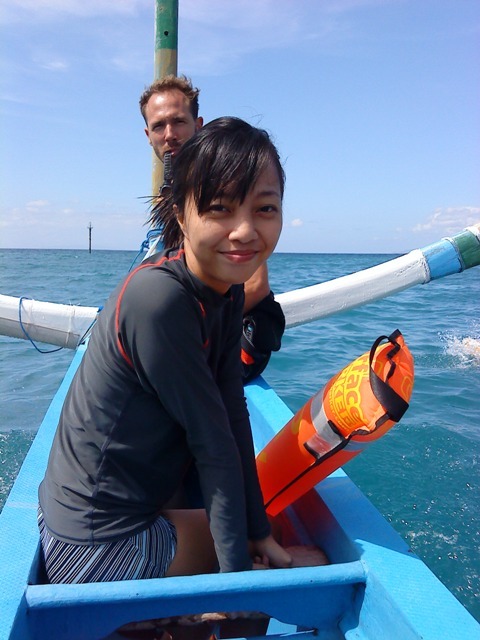 Then maybe taking the license so I will have a dive buddy hihihi..who knows? The dives and snorkeling finished around 14:00. I realized somehow there was no lunch for us?!?! As a regular diving package is. But Thomas, the divemaster, burned me the photo he took underwater into a CD for free. It is the first underwater pictures with me on it. So my upset’s just gone instantly. Well, first agenda has completed. Next, we went for restaurant hunting again cause we were starving to death .. again.. We tried the Lombok local food this time. We had “Ayam bakar Taliwan’ (roasted chicken) with some veggies and sambal and ofcourse rice. The chicken was so hard to bite, but we were so hungry so just tried to fill it up with anything in front of us. 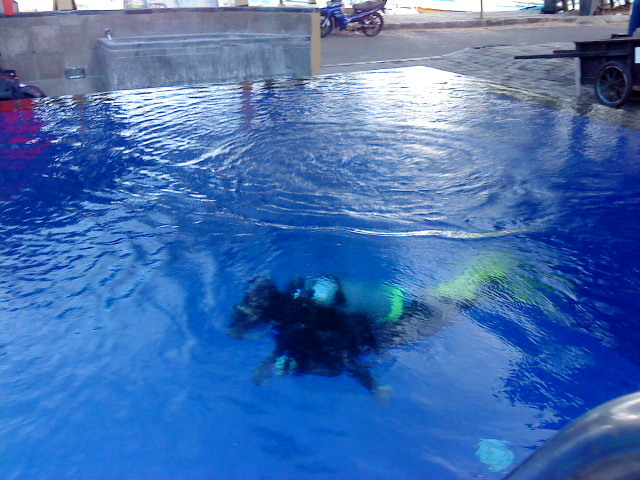 In the afternoon, we went to Absolute Scuba Dive Center for my sister lesson to experience scuba. She was again so nervous that earlier she asked to cancel it. I said it was ridiculous cause the lesson was only in the swimming pool. Althuogh I bet she dragged herself to that pool that day hahaha.. I really enjoyed making fun of her <hope she’s not reading this>. Anyway, the lesson took about an hour and ended up with a conclusion that she wanted to try the ocean dive.. Yeah.. mission accomplished < first step of becoming my future dive buddy LoL>. My sister lesson ended up around 4pm. I actually had one other agenda to check quickly on Bias Tugal Beach. I got info from Thomas that this beach was nice, way better than Bloo Lagoon. So I wanted to check there but my sister wanted to go back to the room. I, then, decided to go there alone. I heard it was only 10-15min walk from our guesthouse. On my way, I met with my sister’s dive instructor. He was going to the same direction with motorbike and offered me a lift. I just jumped in, thought that it would be faster. But somehow the motor ride took longer route than it should be. He said there was another entrance from uphill. I didn’t know so I just followed his advice. It turned out to be my worst decision ever. 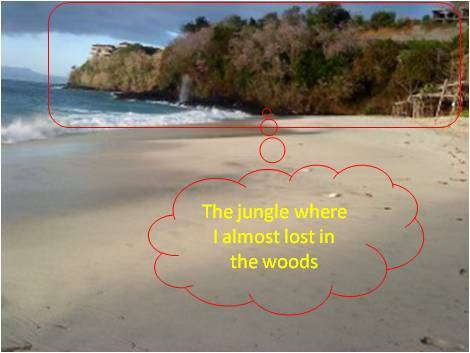 It was almost 5pm, almost dark, and the other entrance was a small path in the jungle. I only saw tress, bushes, cliff and the red soil path. I met a couple but they were going to different direction. I kept walking and walking but it was still up in the hill. I could see the beach from there but it was so in the distance. After few minutes walking, I wanted to go back but I couldn’t see the right path. So I kept walking, speed up my pace.. I kept praying in my heart for His guidance to the correct path. After about 30min, I finally could see the beach in distance and it was getting closer and closer .. and I finally felt its sand on my feet. I felt relieved. I was still afraid because none was there and I didn’t really know how to get back. I took some time to cool my head first before finding the short path back. I took some shots there to calm myself. Then I tried to go back, taking the other direction path. Almost took the wrong turn.. Oh God, there was none there… Plus there are many empty storages and houses, giving it a more spooky vibe. Thanks God a few minutes later I could see from uphill, the big street back to the pier. But my worry didn’t stop there. There was this local guy standing down the hill, on the entrance to the street. He was looking at me with sickles in his hand. Oh My God, I was so scared. He said something and I just replied ‘Halo’ then speed up my pace again.. almost running..
You have no idea how happy I was to find myself back in my room, even with extremely sore legs. I told this story to my sister. She laughed at me and said that was my fault for not listening to her. That night was ended up by playing games and chatting in the internet café and having a nice dinner at a Chez restaurant called “No Name Scuba Warung”. 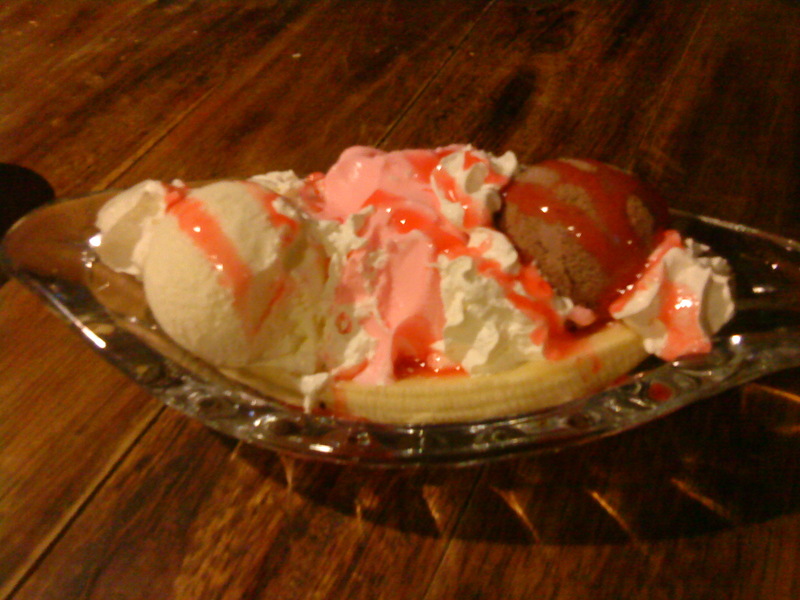 The dinner was delicious <for me>. Overall, this day was exciting and really took all my energy. 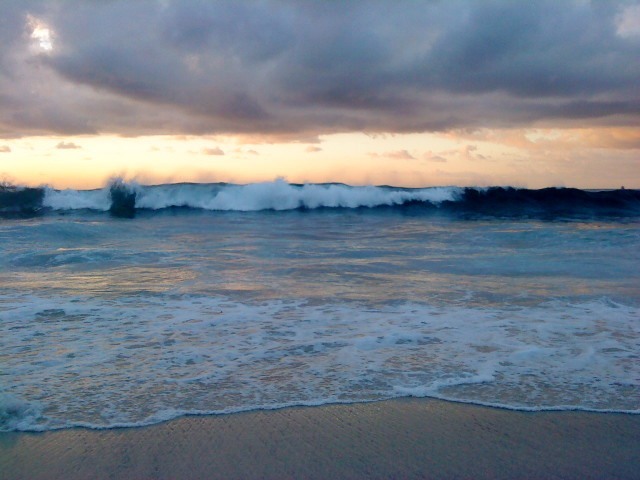 We went to Bias Tugel Beach to see the Sunrise in early morning. It was 6 o’clock and none in the beach. It was a bit drizzling but it went away fast. We took some pictures, stayed there for a while until it was time to pack up and prepare ourselves to go to our favorite place in Bali…. It took about 2 hours to reach Kuta from Padang Bai. 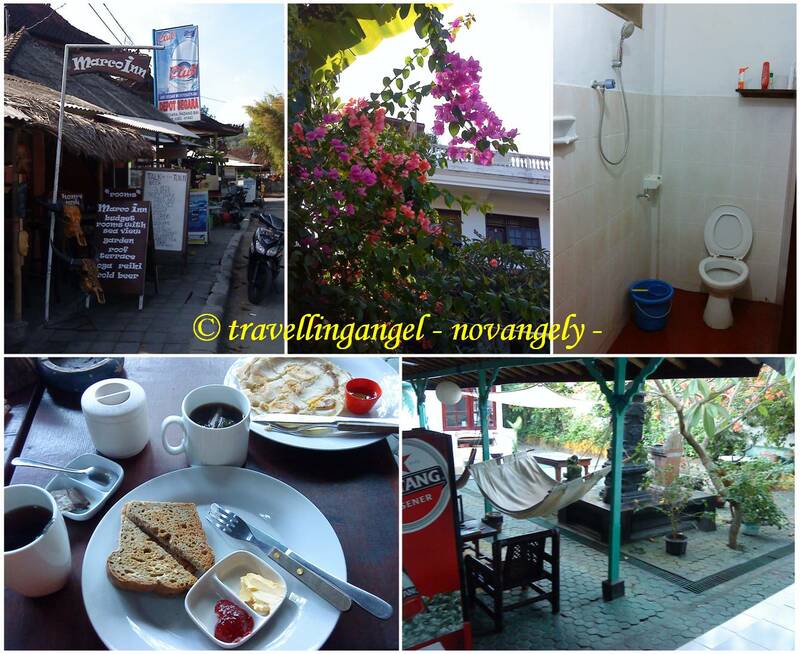 We stayed at Mastapa Garden Hotel in Legian Street. Our first stop after check-in was our fave place for massage, Angeline Spa, near our hotel. 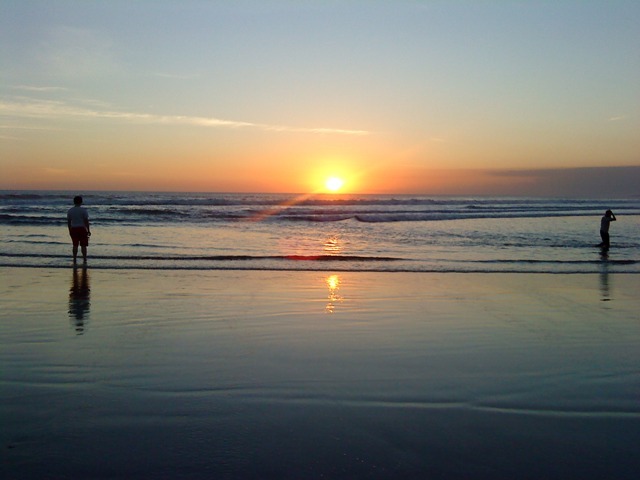 Then we headed to Kuta beach to watch sunset. We were so blessed that day to be able to enjoy sunrise and sunset in the same day. We took the longer road back to our hotel (through Benesari Street). I glanced at many new restaurants and hangout places in Kuta Beach street. I haven’t noticed it from my previous visit, a month before. I think Kuta beach will turn out to be surrounded by commercial places soon. It’s getting crowded and more traffic each time. For dinner, we chose to have it in a little exclusive area, Seminyak. It’s about 5min drive from our hotel.. well, not really 5min if you took taxi in front of the hotel. Legian Stree is the most crowded street at night. <cause same street with the clubs> So we took a little walk to the interception/opposite direction with the club and waited in front of Bank BNI. It is hardly crowded there. 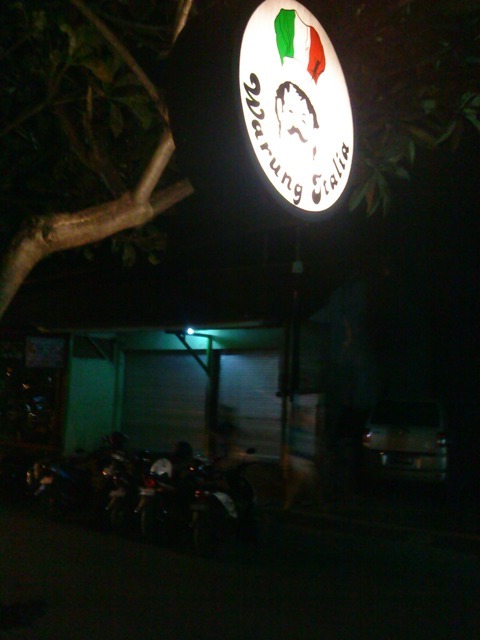 We had our dinner in Warung Itali, which according to the review, they have good pizza. Later then, I also had the same impression :0 Their pizza is delicious, their salad too. But their spaghetti carbonara was extremely salty, don’t know why. On our way back to hotel, we saw other Warung Made restaurant chain in Seminyak. It is bigger than the one near Hard Rock Kuta and has a live music (traditional music play). Next trip, I would love to try eating there. Then last, we spent our “Saturday Night” enjoying the music and dancing in the clubs at Legian and Double Six. It was really a fun ‘girls’ night out’. It’s the last day of our trip. I started my day early. My sister was still crashing in the bed, so I went for breakfast alone. The restaurant in Mastapa Garden Hotel is very traditional. There is a scent of Balinese wood/art and it faces the garden and swimming pool. Looks so at peace there. Too bad the service doesn’t balance with it. The staff didn’t smile at me at all. It looked like she was forced to serve me. Good thing that the breakfast was very good. I tried their American Breakfast in a big enough portion. Then it’s time to try the pool. There was only 1 guest there, laying in the bench near the pool. My head was still having a bad headache but I forced myself to get into the water. Hoping it would wipe out all my hangover. But when I entered it, I instantly screamed (in my head) “OMG! The water is as cold as Padang Bai “. It was so freezing that I only swam a few rounds then decided to go back to my room. What a waste! The pool is really nice!! When I got back , I started to pack up my stuffs. My sister had awaken <good!>. Our flight was 4pm but we should check out before 12 to have some lunch in our fave place, Warung Indonesia, in poppies lane 2. We also had to take the Pie Susu (Milk cream pie) which was quite popular as Bali snack <we love it!> in Toko Bahagia, Denpasar. So we checked out around 11am, left our baggage in the hotel then went to poppies lane 2, passing the legian street, entering the alley across the Bomb Monument to poppies lane 2 then taking Ronta alley, and there it is, our fave restaurant ever!! <coz it’s cheap and taste good> I ordered the spicy potato, sweetsour chicken and some capcay/veggie, I think my sister had the same. We ate there till about 12:30pm. Then I had the feeling to see Kuta beach before leaving which meant taking another long route back to hotel. Soon later we found ourselves in the white sandy beach, attracted by a surfing competition. 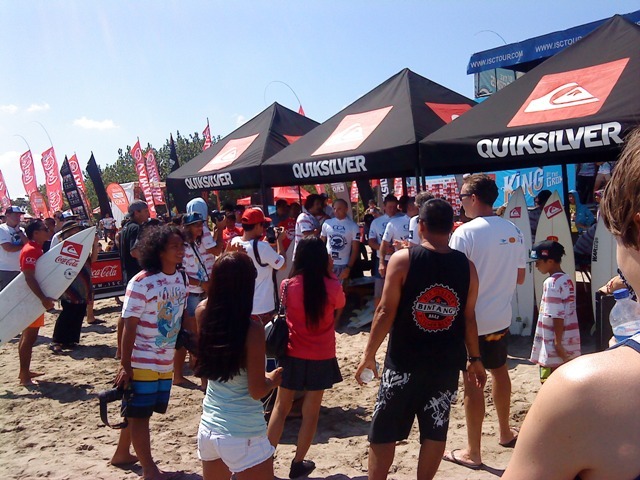 It was our first time watching a surfing competition LoL..
We forgot our tight schedule to Denpasar, thought it would be fast to go there from Kuta on our way to the airport. It turned out to be wrong. The traffic was bad. I had thought we would miss our flight in this high season, which hard to find cheap ticket back. But then calming myself, thinking that we still had our other ticket <ticket for a week holiday>. But still, I had to go back that day. Well, we managed to be at airport 45 minutes before departure, wanted to check in but none there. We had done mobile check-in but we needed to drop our baggage. So I made some searching around and running.. It was all sorted out soon later and we could get to the lounge. We wanted to sit there to take a breath and buy souvenirs… but then, we were called for boarding. Well, some things didn’t go as planned on this trip, but considering that we found a beautiful secluded beach, it was all worth it. Truth to say, I love my stay in Padang Bai for diving. Somehow I like its atmosphere than staying in Sanur or Candidasa during diving trip. So I will definitely be back if I wanna dive there or in Tulamben area. Plus staying a night in the crazy Kuta/Legian area for sure. This place I can’t miss. But I will reconsider for going there in June – July. Hopegully I could also do diving in Bali that time. phuket.. just come along girl 🙂 2 more months to go… can’t wait for it! !